Planning for Retirement: How Long Are You Going To Live? How long are you going to live? 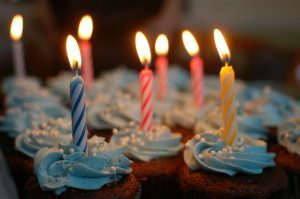 Figuring out your life expectancy is arguably the first step in creating a successful retirement plan–and also arguably the toughest number to figure out. Life expectancy tables are easy enough to find on the web. But it’s trickier than just finding a number. You don’t care what your anticipated lifespan was when you were born; you care about what it is for you today. If you’re reading this, you have made it past most of the early dangers that reduce overall lifespan numbers, so those numbers should not matter to you very much. In other words, you have survived–and so it is likely (to a point) that you will continue to survive. 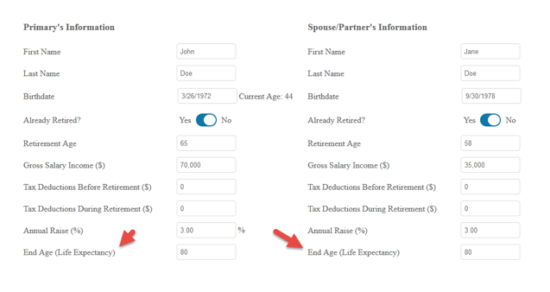 This Social Security Administration life expectancy calculator can help illustrate. You can punch in your birthdate and gender and SSA will give you a life expectancy number. Take that number with a grain of salt, of course: It’s an average, and does not account for your specific health and genetics. In this case, a 38-year-old male can, today, expect to live to 82. The point to note, though, is the trend in the “Estimated Total Years” column. When today’s 38 year old makes it to 62, that number bumps up to 85; at 67, it’s more than 86. Again, up to a point, the longer you live, the longer you can be expected to live. Your life expectancy figure is a moving target–definitely not a set-it-and-forget-it thing. That makes things trickier for the purposes of retirement planning: It’s hard to plan for having enough money to last for the rest of your life when the rest-of-your-life number keeps moving. One way to handle this moving target is to just plan for what seems like a really conservative life expectancy number. That could be 100 years old, or 105. If you plan for the worst and hope for the best, you should be in good shape, right? The trouble with this approach is that it could (and most likely would) lead to your working more years than you really need to. Yes, you have certainty (or as much certainty as you can have with this topic) that you won’t run out of money, but is it worth it if you have to work five or 10 or even more years than you otherwise might have (and then die much earlier than 100)? There is another way. If you can be flexible in your thinking about what you will spend in retirement, you can be more realistic about your life expectancy number–and adjust it along the way as needed. Here’s what we mean. 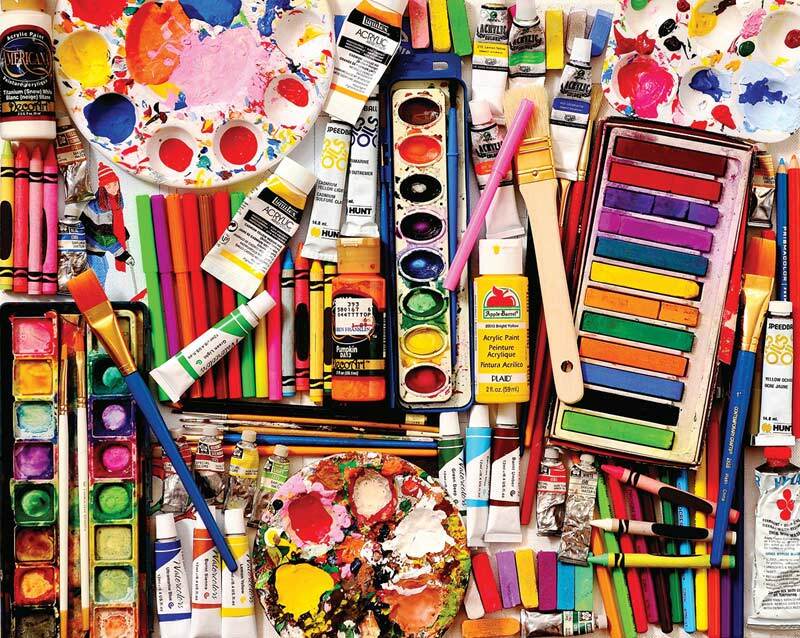 Conventional wisdom used to say that, to retire, a person with a roughly 30-year time horizon should have a portfolio balance that will allow him or her to withdraw 4% of the portfolio’s value per year, and generate 80% of their pre-retirement income. The so-called “4% Rule” has fallen out of favor in recent years for a number of reasons, not least because fixed income yields are so low. Regardless, the rule should only really have served as an estimate in the first place. It’s not just life expectancy that’s uncertain when it comes to retirement planning. Markets can plunge, economies can stagnate, and inflation can eat away at savings. On the other hand, economies can get hot and the stock market can go along for the ride. Very little of what markets and economies will do is predictable in the short term. To absolutely plan on the same withdrawal rate, year in and year out, regardless of what the markets are doing, is almost irrational. 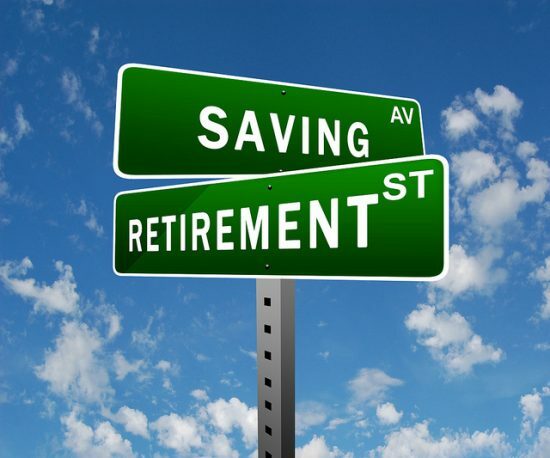 Adjusting your spending behavior when times are tight, just as you likely do pre-retirement, can make your retirement nest egg last a lot longer–in addition to making intuitive sense. 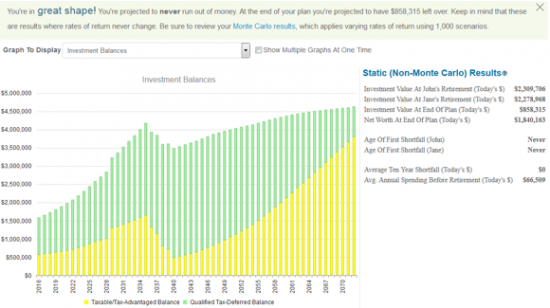 At the very least you should be running scenarios on your life expectancy in an accurate retirement planning solution, such as WealthTrace, which is available to the public. You can see below how one can change the life expectancy and then view the different results. Still, in retirement, the less uncertainty about where your money is coming from, the better. This is where dividend-paying stocks can make a big difference. There are companies that can be counted on to pay–and even increase–their dividends year in and year out, regardless of what the stock market is doing. In the event of a market correction, their stock prices will likely drop along with the rest, but that won’t matter–the dividends should keep coming. 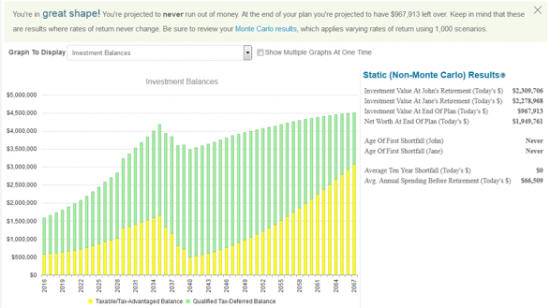 We have found in our research that, using Monte Carlo analysis, investing in the best dividend paying stocks can improve your probability of never running out of money by more than 20%! We become more rigid in our thinking as we age. So it might be tough to consider being flexible about something as important as income and spending in retirement. But a certain level of flexibility can lead to more realistic expectations about what we need to save, and could even lead to an earlier retirement. Should You Pay Your Debt Before Saving? Eight in 10 Americans are in debt and two out of three Americans wouldn’t be able to cover a $1,000 emergency if one presented itself. The solutions to these problems seem simple: pay your debt off and save your money; but which should be done first? The answer to that question depends on what your long-term financial goals are and how prepared you are to begin paying and saving. There are a lot of factors that come into play when making the decision between paying off your debts and saving. Before settling on paying off your debt, you should make sure to have an emergency fund. Things like emergency car repairs, medical bills, last-minute trips, etc. happen. You need to have money set aside in case something happens. 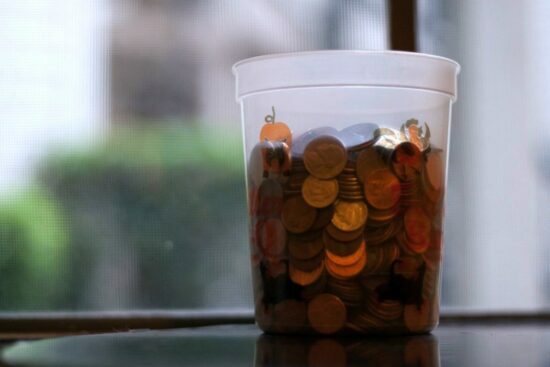 Don’t be discouraged if you don’t have an emergency savings account in place. Most Americans wouldn’t be able to cover a $1,000 emergency if they needed to; however, it is a good idea to have an emergency fund in place. If you are looking to pay off debt, be sure you have at least $1,000 in savings first. If you are wondering about paying off your debt, you should take a look at your debt as a whole. How much do you have? What lifestyle changes will you need to make to pay it off? How much is your debt costing you? Many credit cards and loans have a substantial amount of interest tacked on to it. Once you have emergency savings in place, you should begin to pay off your debt by level of importance. Credit cards and loans with higher interest rates should be paid off first. This will prevent you from throwing out a ton of money on interest. Another thing to keep in mind when you’re trying to decide whether you should pay off your debt or save first is how much you will earn from your savings. If the interest on your savings account is higher than the amount of money you are paying in APR on your debt, save first. This situation is highly unlikely though. Most banks and credit unions have seen a significant decrease in the amount of interest they are paying out on savings accounts. If the APR on your credit card isn’t high, you may want to look into a retirement savings plan or 401(k). Many employers match a certain amount of the employee’s contribution to the plan. If you’ve got your emergency savings set aside and no urgent, high-interest debt to pay off, you may want to see how much more money you need in your 401(k) to get your employer to match you. This is almost like having someone else save your money for you. All in all, you should have a bottom line when it comes to your financial goals. If you are aiming to improve your credit score, you will want to pay off your debt before saving. If you want to improve your investment portfolio, you will want to put off paying off your debt and focus on your investments. If you have a goal for saving for something (i.e. a house, car, college, etc) and you don’t have any urgent debt, you will want to begin to save money by placing it in a high-interest savings account. Making the decision about whether you should pay your debts or save first can be difficult. Keep your long-term financial goals in mind and take the road that will lead you to them. Do you have a story about choosing to pay off debt or save first? Let us know. We’d love to hear from you! Budgeting and saving can be difficult. Even with the most sophisticated of budgets, it is hard to stick to a spending/savings plan. However, it doesn’t need to be so difficult. In fact, you can make minor changes to your schedule and lifestyle that will completely change your finances. Many people choose certain days of the week that they won’t spend money or choose to not spend money from Monday through Friday. 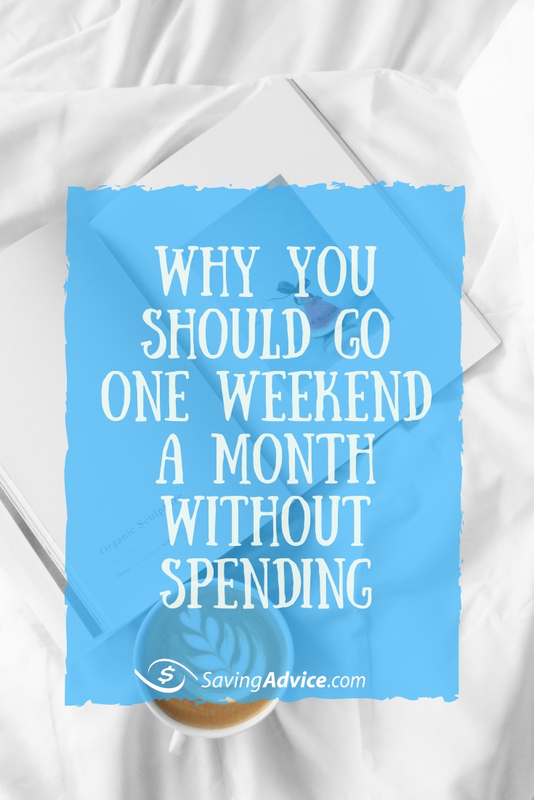 Another great way to save money and spend less is to pick a weekend (or two) out of the month to not spend any money. During the week, you have a lot going on. You are working. You have meetings. It is easier to resist the urge of going out and spending money when you are busy. If you choose to do one of these things (or something else, if you have an idea of your own) instead of spending money, you can save quite a bit of money. Think about the movie ticket for the weekend ($15 average), dinner ($30), going to the bar ($40+), buying a new outfit ($50) and the other expenses that may go along with your weekend plans can stack up quickly. Spending one (or two) weekends a month at home or not spending any money could save you $100 or more each month and help you achieve your overall savings goal. Have you ever tried a “no spending” challenge? How did it work for you? Leave your thoughts in the comments.